Tampa Bay Pools, your Tampa Bay & Clearwater pool builder, invites you to take a look at our June featured pool of the month. This luxurious family-friendly backyard has all of the elements of a fun filled afternoon or the ultimate pool party. The custom swimming pool is a geometric pool (sometimes called a classic pool) with plenty of space for outdoor seating, creating the perfect outdoor retreat. Contact Tampa Bay Pools to get started on your custom swimming pool. Tampa Bay Pools is a custom pool builder serving Tampa Bay, Brandon, Clearwater, and St. Petersburg areas, who understands the importance and value of your own backyard escape. That’s why we build spectacular new inground swimming pools that are easy to maintain. 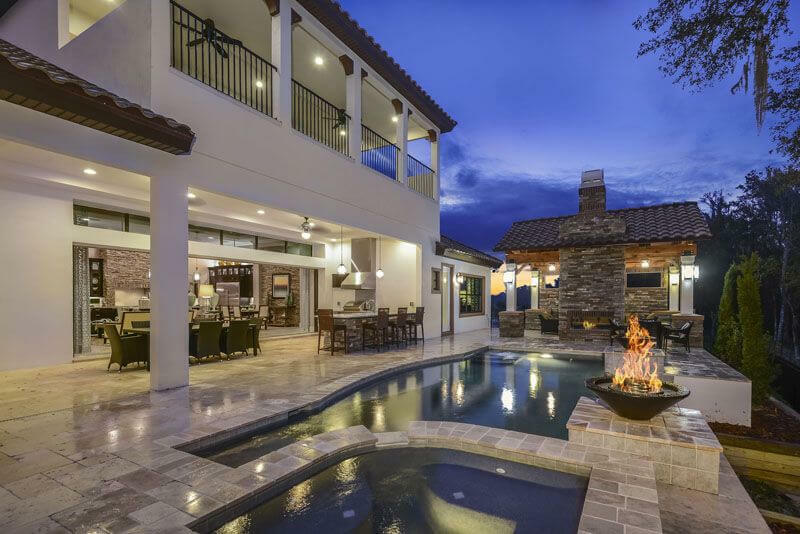 We offer a wide variety of custom projects including residential or commercial swimming pool building, stunning custom features to customize your pool, outdoor enclosures for your backyard oasis, and custom spas. Our pools can be designed to fit any style or budget; we even offer swimming pool financing options.